The FBI's most recent national threat assessment for domestic terrorism makes no reference to Islamist terror threats, despite last year's Boston Marathon bombing and the 2009 Fort Hood shooting—both carried out by radical Muslim Americans. "Domestic extremist violence continues to be unpredictable and, at times, severe," the report states. "Domestic extremists collectively presented a medium-level threat to the United States in 2013; the FBI assesses the 2014 threat will remain close to this level," the report said. On black separatists, the report warned that "high-profile racially charged crimes or events" could lead to an expansion of black separatist groups. The report identified three such groups as the New Black Panther Party, the Israelite Church of God in Jesus Christ, and the Black Hebrew Israelite group as extremists under FBI scrutiny. An alternative assessment section in the report warned that radical black activists could "reinitiate violence at the historically high levels seen for the movement during the 1970s, when bombings, assassinations, hijackings, and hostage-takings occurred." "Such a scenario could occur as an extreme response to perceptions of devolving racial equality or perceptions of racially-motivated police brutality, or racially-biased injustice, oppression, or judicial rulings," the report said. "Indicators include increased weapons procurement, reports of sophisticated plots, and development of an explosives capability." Black extremist groups may also seek "stronger ties to foreign governments in exchange for financial resources," the report said. The report was written before the racial unrest in Ferguson, Mo. However, it mentions that black separatist extremists stepped up threats against law enforcement officers, the U.S. government, and non-blacks following the Trayvon Martin shooting in 2012. "FBI investigations reveal black separatist extremists engaged in financial crimes, and drug and weapons trafficking, possibly to finance activities and maintain access to weapons," the report said. FBI intelligence sources reported that domestic extremist groups "aspired" to carry out violent attacks. "Of a sample of 50 credible violent threat intelligence reports analyzed for this assessment, nearly 60 percent expressed lethal violence as an ultimate goal," the report said, noting militias seeking the overthrow of the U.S. government, sovereign citizens, white supremacists and black separatists were among those seeking to conduct deadly attacks. "Lone actors and small cells will continue to present the greatest threat in 2014," the report says. "Some of these individuals will engage in lethal violence, although it is most likely the majority of violent criminal acts will continue to be characterized as serious crimes, such as arson and assault, but which are not, ultimately lethal." The Bureau anticipates an increase in activity by animal rights and environmental extremists, such as releasing animals and damaging property, as both movements began expanding in late 2013. Additionally, a similar level of activity is expected this year for anarchist, anti-government militias, white supremacy, and sovereign citizen extremists. For abortion extremism, the report says violence prone groups fall into two categories, "anti-abortion" and "pro-choice," but notes the primary threat of abortion extremism comes from lone individuals, not groups. Puerto Rican nationalist extremists were described as "followers of Marxist-Leninist ideology," have targeted the U.S. government for destabilization, and are seeking to create an independent island nation. The FBI estimates domestic extremists caused more than $15 million in financial loses in 2012 and 2013, mainly through animal rights and environmental activities that targeted U.S. agriculture. "It is highly likely extremists will continue to exact financial losses in 2014, with the agriculture, construction, and financial sectors serving as the most probable targets." FBI spokesman Paul Bresson said the issue of not identifying Islamist-origin terrorism in the report "has more to do with how the FBI, from an organizational standpoint, distinguishes [domestic terrorism] and [international terrorism]." "The intended audience of this bulletin understands how we make that distinction," Bresson said in an email, adding that the FBI does not define domestic terrorism "the same way the media does." The Bureau has limited its analytical description of domestic terrorism to groups and people connected to the eight subgroups outlined in the report that use force or violence to coerce or intimidate the population, he said. "The FBI categorizes Islamic extremists and individuals inspired by Islamic extremist groups as International Terrorism," he said. "Even though Ft. Hood and Boston were domestic incidents, the ideology and motivation of those behind them had international elements." He did not elaborate on why the FBI has split local Islamist extremism from other forms of domestic extremism. However, the report links Puerto Rican nationalists to the foreign ideology of Marxism-Leninism and mentions that black separatists have foreign ties. Another explanation for the omission of Islamist extremism in the report is provided in a footnote to a graphic describing an "other" category of domestic extremism not included in the report. "The 'Other' category includes domestic extremist [sic] whose actions were motivated by beliefs which fall outside the eight designated [domestic terrorism] subprograms," the footnote stated. The footnote indicates the FBI has separated Islamist terrorism from other domestic extremism. The Obama administration in 2009 adopted a new policy that substituted the vague term "violent extremism" as a replacement for terrorism. The graphic showed that domestic extremists killed 43 people from 2003 to 2013 carried out by five categories of terrorists—abortion extremists, black separatists, sovereign citizens, white supremacists, and "others." The report left out all references to the April 2013 bombing of the Boston Marathon, which killed three people and injured some 264 others. Two brothers, Dzhokhar and Tamerlan Tsarnaev, who were motivated by Islamist extremist beliefs, carried out the bombing. They learned the techniques for the homemade pressure cooker bombers from an al Qaeda linked magazine. The FBI had been warned in advance of the attack by Russian security services that the brothers may have links to Chechen terrorists but failed to act. The FBI report also made no direct reference to the 2009 Fort Hood shooting, by radicalized Army Maj. Nidal Hasan. The mass shooting left 13 dead and more than 30 injured. Former FBI Agent John Guandolo said he was not surprised the report did not include any reference to domestic-origin Islamic terror. "It should not surprise anyone who follows the jihadi threats in the United States that the FBI would not even include 'Islamic terrorism' in its assessment of serious threats to the republic in an official report," Guandolo said. "Since 9/11, FBI leadership—as well as leaders from Department of Homeland Security, the State Department, CIA, Pentagon, and the National Security Council—relies on easily identifiable jihadis from the Muslim Brotherhood/Hamas, al Qaeda and elsewhere to advise it on how to deal with 'domestic extremism.'" Patrick Poole, a domestic terrorism expert, also was critical of the report's omission of U.S. Islamist extremism, blaming "politically correct" policies at the FBI for the problem. "At the same time we have senior members of the Obama administration openly saying that it's not a question of if but when we have a terror attack targeting the United States by ISIL, we have the FBI putting on blinders to make sure they don't see that threat," Poole said. Guandolo said the failure to recognize the domestic Islamist threat had allowed domestic jihadist groups and their sympathizers to shape U.S. government create policies that do not acknowledge jihad as the root cause for the current global chaos. An example, he said, is that the FBI has appointed a domestic Muslim Brotherhood and Hamas support organization leader to an FBI advisory council at the Washington headquarters. Additionally, the FBI is failing to train agents and analysts on the Muslim Brotherhood network in the United States, Guandolo said. "The FBI, no matter how diligent its agents are in their pursuit of 'terrorists', will never defeat this threat because its leaders refuse to address or even identify it," he said. "This level of negligence on the part of the FBI leaders and their failure to understand the jihadi threat 13 years after 9/11 is appalling." Poole said the failure of the FBI to understand the domestic Islamist threat led to the U.S. government categorizing the 2009 Fort Hood shooting Army Maj. Nidal Hasan as "workplace violence." "In the case of Fort Hood, the FBI was monitoring Maj. Hasan's email communication with al Qaeda cleric Anwar al-Awlaki but the FBI headquarters dismissed it because they were talking about 'religious' subjects," Poole said. "In the Boston bombing case the FBI cleared Tamerlan Tsarnayev with nothing more than a house visit after receiving a tip from Russian intelligence, and never making the connection that he was attending a mosque founded by an imprisoned al Qaeda financier and previously attended by two convicted terrorists," Poole added. As a result "we have more than a dozen dead Americans killed here at home because of these politically correct FBI policies, and with threats emerging from all corners this doubling-down on political correctness when it comes to Islam is undoubtedly going to get more Americans killed," he added. 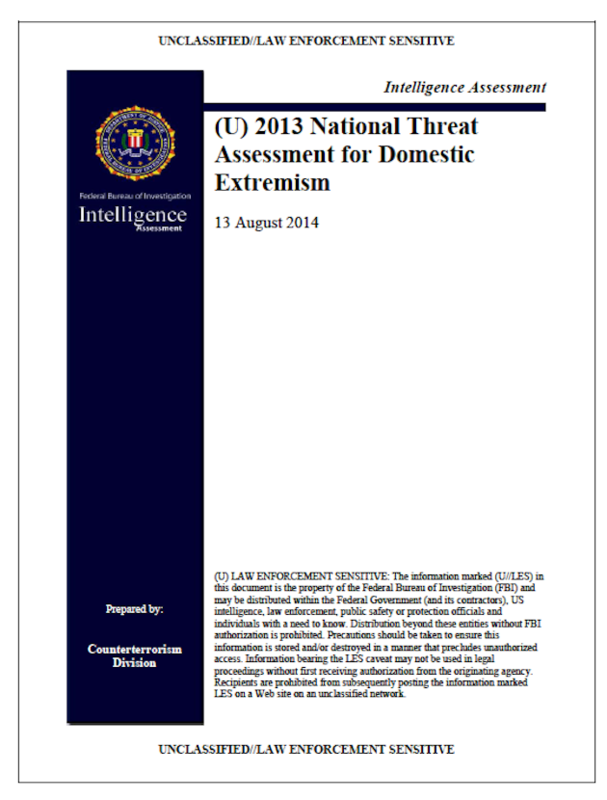 The domestic threat assessment is the latest example indicating the FBI has been forced by Obama administration policies from focusing on the domestic terror threat posed by radical Islamists. Rep. Louie Gohmert (R., Texas) said in a 2012 House floor speech that the FBI was ordered to purge references to Islam, jihad, and Muslims in its counterterrorism "lexicon" guidelines for its reports. As a result, the FBI is hamstrung from understanding the threat of terrorism from groups like al Qaeda that have declared jihad, or holy war, on the Untied States, Gomert said. Guandolo, the former FBI agent, said the vast majority of U.S. Islamic organizations were identified in recent U.S. terrorism trials as part of the Muslim Brotherhood, the parent group for the Palestinian terror group Hamas. Thus, these groups are aligned with the same objectives as the Islamic State of Iraq and the Levant, al Qaeda, and others, he said. "Our FBI is not teaching their agents and analysts this information; they are not sharing it with local and state law enforcement officials; and they are not investigating and pursuing the very individuals and organizations which are supporting and training jihadis in America," Guandolo said. Guandolo said former FBI director Robert Mueller testified to Congress that he was unaware that the Islamic Society of Boston was the organization behind the radicalization of the Tsarnaev brothers. "That tells you all we need to know about the FBI's leadership about the threat here in America from the Islamic Movement—they are clueless," he said. This entry was posted in National Security and tagged FBI, terrorism. Bookmark the permalink.